BNAC encourages participants to make short presentations that share research findings or discuss ongoing projects that focus on Nepal or the Nepali cultural world. Research from all disciplines will be considered, including work relating to the Nepalese Diaspora. We encourage presentations on all stages of research, and particularly welcome abstracts by masters and doctoral students. The 2012 Study day, held at Reading was popular and well attended. If you are interested in participating please send a brief abstract of 250 words to ‘The Organisers’ at: bnacstudyday@gmail.com by 5pm on Thursday, 28 February 2013. In keeping with previous study days, only abstracts will be circulated in advance, with full papers presented on the day. 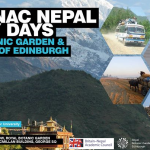 Members of BNAC may attend the Nepal Study Day for free, while for non-members the attendance fee is £20. Lunch will cost around £8 (each day), to be paid in cash on the day. Small bursaries towards travel costs will be made available to students whose presentations are accepted. Deadline to submit abstracts: Thursday, 28 February 2012. Deadline to register for those who are not presenting paper but wanting to participate: 15 April 2012.
more information and registration, please contact study day organizing team.